Performed: Dublin Theatre Festival/King's Head, London/New York & Chicago. Performed: ContemporEire'84, Dublin/Drama Fests/ Schools Fests, St. George, Canada. Performed: ContemporEire'84, Dublin/Drama Fests/ Schools Fests, Hollister, California. Cast: 3 Waiters (M or F) + 2F + 3M. Set in a restaurant. Performed: Pentameters, London/Dublin Theatre Festival/Drama Festivals, USA, South Africa and Australia. Performed: Pentameters, London/Andrew's Lane Theatre, Dublin. Drama Festivals, Ireland & Australia. Performed: Andrew's Lane Theatre, Dublin. UK, Canada, USA & The Philippines. Cast: 2F. 2M. Set in a run down house in the early 1990's. 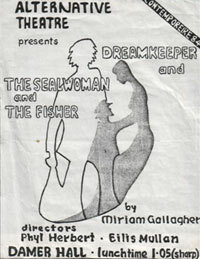 Performed: Galloglass Theatre Company's National Tour 2001. Performed: Martin Murphy High School, Hollister, California. Cast: People of Ranelagh from (1208-1988). Set: Ranelagh gardens past + present (suggested) Mime/dance/music. Performed: Dublin Millennium Project 1988 (Ranelagh and Rathmines). 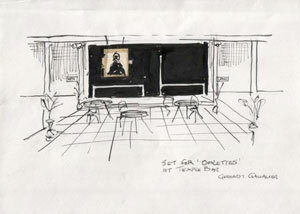 Performed: Gate Theatre Dublin, and Crypt Arts Centre, Dublin Castle. Cast: 3F. Set in a smart city café (suggested). Performed: Chicago Gaelic Park Irish Fest by Nightblue Theatre. Cast: 1M + Musician[s.] Performed: Nat. Concert Hall/Rté Radio/Carolan Festival, Keadue. Helsinki, Turku, Tallin, Estonia & Saratoga Springs, USA. Cast: 1F -2M + Pianist. Performed: National Concert Hall/Dublin Millennium 'Field Days' Festival. Int. Field Festival, Maynooth university, Carrick Watermusic Festival. Cast: 1F -2M (doubling) + Pianist. Cast: 1F- 2M + Pianist. Performed: National Concert Hall/Rté Radio/Garter Lane, Waterford, Dundalk Arts Centre. Cast: 4F- 4M. Set in the Wellenough Clinic (suggested). Performed: Dublin Theatre Festival. Cast: 8F-3M. Set in a Women's Prison (suggested). Performed: Damer Hall/ Samuel Beckett Centre/Community + VEC Tour. Cast: 1F (or 2F-1M -as Rté Radio 1999). Set: A railway station in Limbo. Performed: Andrew's Lane Theatre, Dublin, Rté Radio. Readings: New York, 4th Int. Women Playwrights' Conf. Galway. Performed: Glór Theatre, Ennis Co. Clare + Tour. (in collaboration with Mia Gallagher & Nathalie Rafal). Cast: 2 F + chanteuse. Performed: Samuel Beckett Centre, Trinity College, Dublin; Le Petit Hébertôt Theatre, Paris, France. Readings: IFC, Dublin, Athens University, 5th Int. Women Playwrights' Conference 2000. Cast: 2F 2M. Set: A Wasteland with DSR. area used for some indoor scenes. Performed: 2014 Ranelagh Arts Festival. Staged Reading (2011) by 9Thirty Theatre Co., Bridge Theatre, New York City.